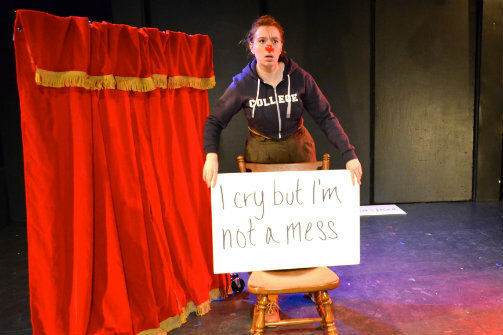 There are only two more chances to see Antonia Lassar’s rip-roaring, thought-provoking, solo-clown show Post Traumatic Super Delightful, at the New York Frigid Festival: Wednesday, March 4 at 5:30pm and Friday, March 6 at 8:30pm. See it! See it if you consider yourself a feminist, see it if you or someone you know identifies as a survivor of sexual assault, see it if you’re a college graduate. Lassar and director Angela Dumlao are using the power of theater to both educate audiences on an increasingly hot-button issue and offer a revolutionary way of discussing it: through laughter. Read my review below or over at TheatreIsEasy.com. Antonia Lassar in ‘Post Traumatic Super Delightful.’ Photo by Kati Frazier.